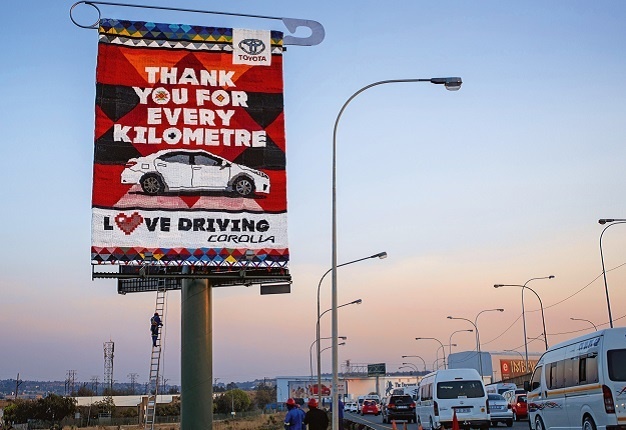 Toyota South Africa has created a ‘beaded billboard’, with the help of Woza Moya, to thank Corolla owners for the role they play in making the iconic car a success. Toyota SA said: "In the Zulu culture, love letters are traditionally crafted out of beadwork by Zulu women, each is a work of art and totally unique. This truly South African declaration of love seemed like a fitting way to celebrate South Africa’s most loved car." Arguably one of the world’s largest beaded creations, the Corolla billboard was unveiled on earlier in September. Located on the M1 De Villiers Graaff Highway – after the Crown Interchange and before the Booysens Interchange – the beaded billboard will be on display until October 16. Toyota SA said: "Coinciding with the national heritage month, the Corolla is in its own right a heritage model in the Toyota fleet. That the Corolla billboard is made from beads is also fitting in celebrating its heritage, as beads are themselves con-sidered a continental heritage. "As a cultural heritage, beads have served as jewellery, pieces of art, haute cou-ture as well royal regalia in Africa as far back as 12 000 ago." The beaded billboard measures 12m X 9m, weighs over 1 tonne, and comprises over 138 000 individual beads sewn together by 350 women crafters from Woza Moya. Woza Moya is the economic empowerment project of the Hillcrest AIDS Centre Trust in KwaZulu-Natal, the province where Toyota SA has manufactured the Corolla since 1972. In addition to the billboard the crafters have also beaded 7500 individual Corolla beaded love letters for new Corolla buyers and Toyota Staff. 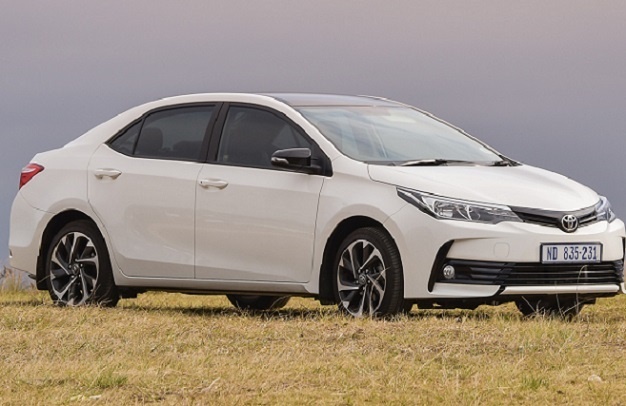 Glenn Crompton, Vice-President of Marketing at Toyota SA, confirmed: "It was vitally important for us that this campaign, an act of thanks to Corolla drivers and their Corollas, also said ‘thank you’ to the community in which our Corollas are put together. "Since 1975, the Corolla plant has been in KwaZulu-Natal, so the fit between Wo-za Moya and the campaign was ideal. We’re thrilled to have been able to create work for the crafters who belong to the initiative." Now well into its eleventh generation, and more than 50 years since being intro-duced onto the market, there is no doubt that Toyota has had enough time to per-fect the Corolla recipe. Not only does it remain the world’s best-selling nameplate in automotive history, it’s still one of the most popular vehicles in the Toyota line-up. 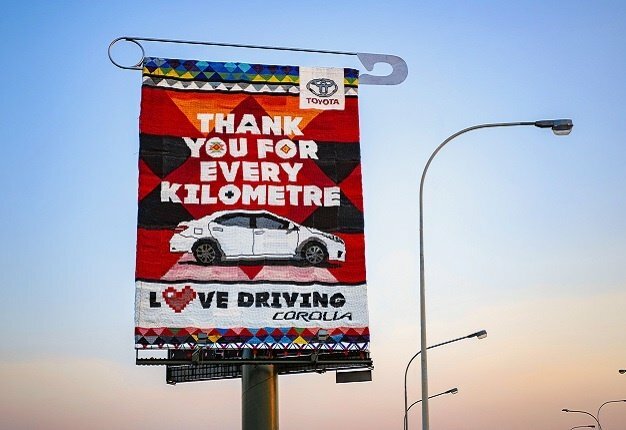 According to Janine Kleinschmidt – Creative Director responsible for the design – the decision to celebrate Corolla and its drivers with a beaded billboard was sparked by the thinking behind the Special Edition Corolla, which rolled out earlier this year. Kleinschmidt explained: "Toyota SA wanted to celebrate the fact that Corolla has been the most loved car in South Africa since ‘forever’ while entrenching its posi-tioning ‘Love Driving’. The intricate workmanship in the Special Edition Corolla launched earlier this year was evocative of the uniquely South African visual lan-guage of Zulu love letters, so we used this to the art direction and design of the campaign. "We absolutely love what we’ve achieved, and we’re thrilled that Toyota SA in-sisted the campaign include a large corporate social responsibility element. It has been an honour to work with the crafters from Woza Moya."